Every year, millions of Americans who purchase a “real” Christmas tree don’t properly secure it to their vehicle, risking serious vehicle damage, dangerous road debris, and hefty fines. The Auto Club of Southern California is urging all motorists to make sure their holiday trees are safely secured this holiday season to avoid preventable crashes and damage. Christmas trees that are not properly secured are a safety hazard for other motorists. According to the AAA Foundation for Traffic Safety, road debris – which could include objects like improperly secured trees– was responsible for more than 200,000 crashes that resulted in 39,000 injuries and 500 deaths over a four-year period. About two-thirds of debris-related crashes are the result of improperly secured items falling from a vehicle. Drivers can face civil and criminal penalties if an unsecured tree falls off their vehicle. The California Vehicle Code prohibits transporting cargo such as a tree in an unsafe manner, and holds drivers responsible for any cleanup or damage costs caused by any object that falls off their vehicle. Drive slowly and easily. Use less-traveled streets, if possible. Higher speeds create significant airflow that can damage your Christmas tree and challenge even the best tie-down methods. 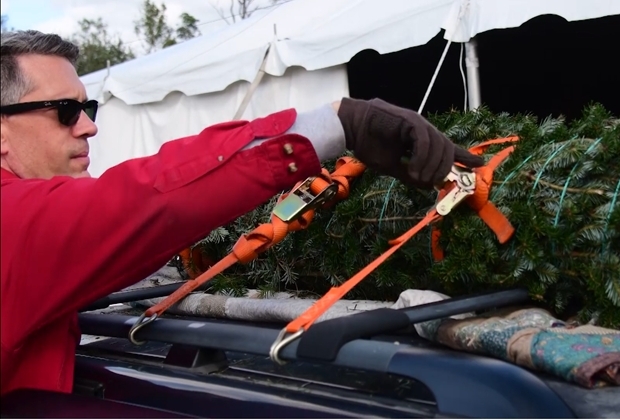 Editors: Video B-Roll from AAA of how to safely secure and transport a Christmas tree is available here. Please credit AAA.